This Exchange is only open to those with active websites or blogs. 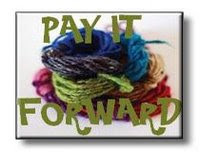 ALL YOU HAVE TO DO IS PROMISE TO POST THE SAME PAY IT FORWARD PICTURE AND THIS MESSAGE ONTO YOUR BLOG, WHICH MUST BE ACTIVE IN ORDER TO PLAY. YOU WILL PAY IT FORWARD TO THREE PEOPLE WHO COMMENT ON YOUR BLOG. And then, await a gift in the mail and plan gifts for three more lucky girls (or guys - I don't discriminate...). It's all perfectly easy, right? I mean, copy a picture, save it, post it, right a pithy story and bask in the glory of your creation. Easy. But see, I have follow through issues. I would never make it on the pro golf circuit. Or tennis. Or any sort of sport, really. (Follow through...get it? Get it? Oh never mind.) I remember when my high school gym teacher coached me from the sidelines of a friendly game of softball. I stood at the plate, two strikes against me - for this time up...I think I struck out every time I batted. But this last pitch, this last at-bat of the day, she encouraged me to "think like it's a note - a musical note! And just hit the daylights out of it!" Now that kind of terminology, I comprehend. Ladies, Pookie and I will draw 3 names from any comments left on this post and you will receive a gift within the new year (no worries - WELL before 2010, I PROMISE!). Just play along, post the picture and the words and pay it forward, as well! Oh! And do you wanna know how the softball game ended?! Well, that's a story for a different post, now, isn't it?